2016.04.14. FATCA: A Foul Up, Suzanne Herman, The Local. 2016.04.14. So now the CRA is going after infants? Lynne Swanson, iPolitics. 2016.03.26. Taxation Abroad, Suzanne Herman, Fernandina Beach News-Leader. 2015.07.28. Fighting FATCA “Tyranny”, Lynne Swanson, Tax Connections. 2015.06.04. FATCA is an attack on Canadian sovereignty, Lynne Swanson, The Hill. 2015.05.05. Making Citizenship-based Taxation Reform Easy, Lynne Swanson, Tax Connections. 2015.04.28 Americans abroad need tax justice too, Lynne Swanson and Victoria Ferauge, The Hill. 2014.11.28. USA Went to War With UK Over Taxing .. See the Irony, Lynne Swanson, Tax-News. 2014.07.08. Why Does US Congress and IRS Want a Canadian Cop? Lynne Swanson, TaxConnections. 2014.06.25. Canadian House of Commons Votes to Help US IRS Seize Bank Records of Canadians. Lynne Swanson, Tax-News. 2014.06.09. FATCA “Sea Change”. Lynne Swanson, Tax-News. 2014.02.07. Canada Capitulates on FATCA Agreement. Don Whitely, BC Business, Canada. 2014.02.04. Is Uncle Sam’s IRS After You? Lynne Swanson, London Free Press, Canada. 2014.01.08. Cruzing in Reverse, Lynne Swanson, OpEd News, USA. 2013.12.16. U.S. Citizenship Based Taxation: Unique or Outrageous. Lynne Swanson. Tax News. UK. 2013.10.25. FATCA Attack Around the Globe, Lynne Swanson, OpEd News, USA. 2013.10.09. Reality Check, Lynne Swanson and Victoria Ferauge, Tax-News, USA. 2013.10.06. FATCA: We Are Not Myths, Lynne Swanson, OpEd News, USA. 2013.10.01. Open Letter to President Obama, US Treasury Secretary Jack Lew, IRS Acting Commissioner Daniel Werfel, Senator Carl Levin, The Money Guide. Canada. 2013.09.17. Dual Canadian- American Citizens: We Are Not Tax Cheats. Lynne Swanson. Financial Post. Canada. 2013.09.11. FATCA: Losing its Way. Victoria Ferauge and Lynne Swanson . Accounting Today. USA. 2013.08.22. Nothing Against the United States (Until Now). Lynne Swanson. The Hill. USA. 2013.07.31. FATCA: A Simple Premise Gone Terribly Wrong. Victoria Ferauge and Lynne Swanson. The Hill. USA. 2013.01.07. IRS Wants Canada to Nab US Tax Cheats: Why We Should Care. Don Whitely. The Globe and Mail. Canada. 2012.11.25. The Accidental Kenyan: What Would Happen if the African Nation Copied US Tax Policy? Don Whitely. Vancouver Sun. Canada. 2012.10.05. US Tax Laws: The Long Arm of Uncle Sam. Don Whitely. BC Business. Canada. 2018.07.18. FATCA Repeal Update: The action to take right now! Suzanne Herman and John Richardson interviewed by Anthony E. Parent, IRS Medic. video. 2018.04.30. Trump’s tax reform affects Canadian residents,The National, CBC TV, Canada. Suzanne and Ted Herman interviewed. 2018.04.30 Trump tax reform resulting in massive bills for thousands of Canadian residents, CBC News, Canada. Suzanne and Ted Herman interviewed. (Note: the term “Canadian residents” is used in these CBC headlines. This could lead one to think it only affects people with permanent, or even temporary, resident status, but this matter also affects Canadian citizens (which the Hermans are)). 2018.03.04. Tax fears: US-Aussie dual citizens provide IRS with details of $148 billion, Julie Powers, Sydney Morning Herald, Australia. Karent Alpert interviewed. 2017.02.11. Toward Natural Born Derivative Citizenship, John Vlahoplus, British Journal of American Legal Studies, Vol 7 (forthcoming/draft). Carol Tapanila (Calgary 411) quoted footnote 49, p. 12. 2017.01.29. Transfer of Canadian banking records to US tax agency doubled last year, Elizabeth Thompson, CBC, Canada. Lynne Swanson quoted. 2016.11.10. Karen Alpert interview, “Time for a Change: The US-Australia Tax Treaty”, Anthony Parent and Claudine Gindel, IRS Medic. 2016.09.15. US tax laws, politics pushing more dual citizens to renounce citizenship, Jeff Lee, Vancouver Sun, Canada. Tricia Moon interviewed. 2016.09.11. US citizens renouncing because of tax laws affecting Australian superannuation, Julie Power, Sydney Morning Herald, Australia. Karen Alpert interviewed. 2016.03.17. Revenue minister could have to face committee on record sharing with IRS, Elizabeth Thompson, iPolitics, Canada. Lynne Swanson mentioned. 2016.03.17. Trudeau Liberals reverse position on controversial IRS information sharing deal, Elizabeth Thompson, iPolitics, Canada. Lynne Swanson mentioned. 2016.03.16. Revenue Canada quietly handed 155,000 Canadian banking records to IRS, Elizabeth Thompson, iPolitics, Canada. Lynne Swanson quoted. 2016.03.16. John Richardson, ADCS co-chair, interview. “The Exchange,” CBC-tv, Canada. 2016.03.05. Border babies v the IRS, The Economist, UK. Coverage of the ADCS lawsuit. 2015.08.20. IRS sued over treatment of Americans who bank abroad, Paul Mirengoff, Powerline, US. 2015.08.27. Ruling next month on Canadian citizens’ challenge to FATCA, STEP. 2015.08.26. Which will come first: A decision in the FATCA legal challenge or the first exchange info?, Mary Teresa Bitti and Jules Melnitzer, Financial Post, Canada. 2015.08.04. Two Women Challenge Law Allowing Ottawa to Give Info to US Tax Collectors, Neal Hall, Metro News, Canada. Lawsuit by US Presidential Candidate Challenges the Constitutionality of FATCA, Leslie Kellogg, JD Supra. Stephen Kish mentioned. 2015.07.18. Another Look at FATCA, One Citizen Speaking, US. Stephen Kish and Daniel Kuettel mentioned. 2015.04.16. FATCA Victim, on Renouncing Citizenship: “It was a gut-wrenching experience that I do not think I will ever be over,” Matt Welch, Reason.com. Features Ruth Freeborn. 2015.04.15. One-Third of Americans Living Abroad Have Thought Actively About Renouncing Citizenship Due to Tax Filing, Matt Welch, Reason.com. Illustrated with photo of Brock’s Anti-FATCA Protest, Parliament Hill. Canada, October 2013. 2015.03.30 Living in the Past: Citizen Relinquishments: Am I Still a US Tax Citizen, Virginia La Torre Jeker, Anglo-Info, Dubai. ACDS Co-Chair John Richardson quoted. 2015.03.01 More than one way to skin a FATCA, CPA Canada, refers to Canadian Rocky Martin (Krackerjack 121)’s renunciation in Mexico. 2015.02.27 Alberta online bank first in Canada to shun US clients amid tax rules, Barrie McKenna, Globe and Mail, Canada. Tricia Moon quoted. 2015.02.15 Goodbye, Uncle Sam? How the Foreign Account Tax Compliance Act is Causing a Drastic Increase in the Number of Americans Renouncing their Citizenship, Taylor Denson, Houston Law Review. This references Lynne Swanson’s and Victoria Ferrauge’s article in Accounting Today. It also mentions Peter Dunn, contains a paragraph on Daniel Kuettel, and a paragraph on the ADCS lawsuit. 2015.01.08. David Kuenzi, Ask an Expert: How to Handle Foreign Pension Limbo, Wall Street Journal, US. Neill Clift asks a question on pensions. 2014.12.08. Ask an Expert: Answering an Expat Reader’s Real-Estate Sale Query, Jonathan Lachowitz, Wall Street Journal, US. Suzanne Herman asks a question on capital gains. 2014.11.18. Meet the Alberta man who went to Tijuana to renounce his US citizenship. Rocky Martin interviewed by Patrick Cain, Global News, Canada. 2014.10.30. Tricia Moon interviewed on Canada AM, CBC. 2014.07.23. Metro Vancouver Woman Joins Movement to Drop US Citizenship, Douglas Todd, Vancouver Sun. PatCanadian interviewed. 2014.07.04. Anti-American July 4th Party Held in London, CTV News, Canada. Lynne Swanson (Blaze) and Native Canadian are interviewed. 2014.07.04. WhiteKat interviewed on “All In A Day”, CBC Radio, Canada. 2014.07.04. U.S. tax crackdown driving more expats living in Canada to Renounce Citizenship. Barbara Shecter, Financial Post. Gwen and Tricia Moon interviewed. 2014.07.04 Fighting US Tax Treaty Isn’t Lost Cause To Him. Tim Harper, Journal-Pioneer, Summerside, Canada. Stephen Kish interviewed. 214.07.03. Expats Feel Sold Out by Canada: Canadian citizens with US roots plan a court challenge after Ottawa rolled over to Washington’s heavy-handed search for back taxes, Tim Harper, Toronto Star, Canada. Stephen Kish interviewed. 2014.06.30. Independent Nation on ThatChannel. Peter Dunn and Tricia Moon interviewed by John Richardson. 2014.06.14. More Expatriate Americans Break Up With Uncle Same To Escape Tax Rules. Wall Street Journal, US. Tricia Moon interviewed. 2014.05.13. Lynne Swanson’s presentation to the House of Commons Finance Committee. 2014.04.26 More Renounce US Citizenship but Deny Stereotype. Adam Geller, AP Bloomberg Business Week News. Carol Tapanila interviewed. 2014.04.22. More Renounce US Citizenship but Deny Stereotype. Adam Geller, AP (Sioux City Journal), US. Carol Tapanila interviewed. Preview with photos. Full article due out April 27th. 2014.04.20.U.S. tax law could ensnare unsuspecting Canadians. Bill Mah, Edmonton Journal. Gwen interviewed. 2014.04.08. The Dark Road: The Worst Tax Law You’ve Never Heard About. Alex Newman, The New American. Ruth Freeborn interviewed. 2014.04.04. How to Get Rid of an Unwanted US Citizenship. Patrick Cain, Global News, Canada. Lynne, Vi, Carol Tapanila and Kathleen interviewed. 2014.02.12. This Could Destroy the Lives of Millions. Gwen interviewed. International Man, Nick Giambruno. 2014.02.12. Washington and Ottawa Reach Tax Deal. WBFO, Buffalo, US. Ruth Freeborn interviewed and Allison Christians, Chair, Tax Law Dept, McGill Univ. Faculty of Law interviewed. 2014.02.11. Independent Nation with John Richardson and Bahman Yandazfar. Peter Dunn and Tricia Moon interviewed. Canada. 2014.01.15. “IRS Could Pry Into Canadian Bank Accounts“. Gwen interviewed. Wei Chen, Ontario Morning, CBC Radio, Canada. 2014.01.13. US FATCA Tax Law Catches Unsuspecting Canadians in its Crosshairs Carol Tapanila and White Kat interviewed. Amber Hildebrandt, CBC, Canada. 2013.11.27. New Tax Law Driving Expats to Renounce US Citizenship. Ruth Freeborn interviewed. William Douglas, McClatchy DC, USA. 2013.11.19. The World at Six. Gwen interviewed. Also interviewed Allison Christians (Chair, Tax Law, McGill University Faculty of Law) and Marion Wrobel (VP Policy, Canadian Bankers Association), James Fitz-Morris, CBC Radio. Canada. This segment is at 14:47 to 17:37. 2013.11.15 . Grassroots Challenge to FATCA in Canada. Tod Stoner, Cayman Compass. Cayman Islands. 2013.11.13. FATCA Under Fire From Tax Experts and Canadian Citizens The Current w/Anna Maria Tremonti. Ruth Freeborn (AtticusinCanada) interviewed. Also Allison Christians (Chair, Tax Law, McGillUniversity Faculty of Law and Marion Wrobel, VP Policy, Canadian Bankers Association). CBC Radio. Canada. 2013.11.10. Talking FATCA with the Stateless Man. Victoria Ferauge and Daniel Kuettel . The Stateless Man, internet. 2013.11.08. FATCA Draws Protestors Out in the Cold. Shealin Boswell. The Press. Canada. 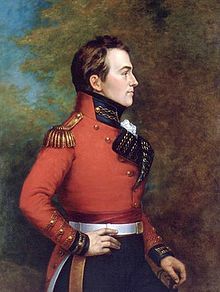 Makes reference to Isaac Brock Society. 2013.10.28. Peter Dunn tells CCTV that the United States is the Greatest Threat to his Family in Canada. CCTV. 2013.10.01. Why I Gave Up my US Passport. 20 individuals from various countries, including Michael Putnam. BBC News Magazine. United Kingdom. 2013.09.30. What it feels like to give up your American citizenship. Swiss citizen Daniel Kuttel on renunciation. BBC World Service. United Kingdom. 2013.09.26. Why Are Americans Giving Up their Citizenship? Simple Answer, FATCA. Victoria Ferauge interviewed. BBC News Magazine, United Kingdom. 2013.08.17. Overseas Americans: Time to Say ‘Bye’ to Uncle Sam? Daniel Kuettel interviewed. Laura Saunders, Wall Street Journal. USA. 2013.08.09. Number of Americans Renouncing Surges. Carol Tapanila interviewed. Liam Pleven and Laura Saunders, Wall Street Journal. USA. 2013.05.04. Marvin van Horn interviewed by David Kestenbaum on Planet Money. NPR, USA. 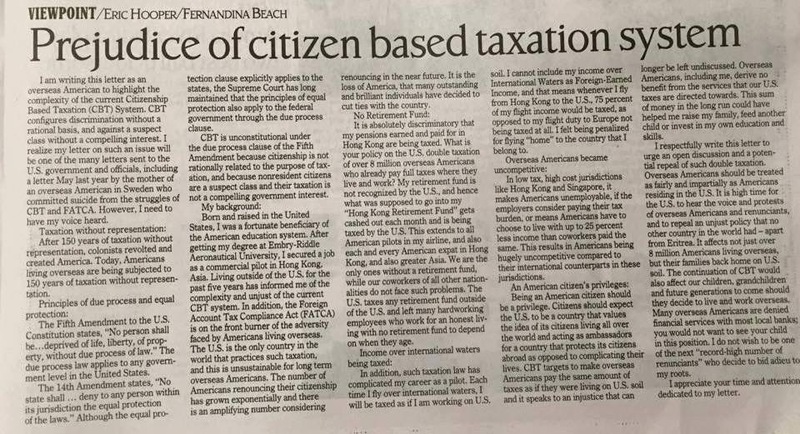 Nice one @Bubblebustin – will flag the issue for those who have no clue about US extraterritorial taxation – or even that people ARE BORN WITH BOTH US AND NON-US citizenship all the time, and have family and totally legitimate lives outside the US. A novel concept for many apparently. Putting it in translation for the American context and pointing out the loss to the US – of freedom of movement, of loss of opportunity, etc. helps the homelanders understand. I just emailed you the Eric Hooper article as a photo. If there’s some way you could post it here and on the media thread in reference to Jefferson’s post, that would be great. Thanks, bubblebustin. Here is the Eric Hooper / Pilot US-taxed when flying over international water .jpg file and I will also put it into the media thread in reference to Jefferson’s post. Click on image to enlarge a little for easier reading. Here’s my editorial in my local paper published today. I wish I’d had the final edit (the editor had to shorten it significantly), but I hope it does the trick – that is have people consider offering themselves a witnesses for the lawsuit. “Trudeau’s Liberals have spent much of their short time in power undoing legislation passed by the previous government. Salient amongst these are laws that effectively divided this country’s population into various classes of citizens, ranging from Harper’s “old-stock” right down to those who could readily be deported and relieved of their passport. It is a great pity the items on the house-cleaning list have not included the “enhanced” tax agreement with the United States that has effectively reduced Canadians deemed to be also “U.S. persons” to the status of second-class citizens.”…………..
Three cheers for our intrepid trio of outstanding writers, working persistently for the cause. Thank you all! You’re welcome, Badger. It’s been a week now and a new edition of my local paper’s come out where no one’s responded to or refuted what I wrote last week. Very nice work, Mary and the two Laura’s. Kudo’s! Thanks so much for letting us know that our article/letter to the editor was published in Cornwall, Ontario. Let’s hope some of the other 150 border town news services we wrote to will be similarly interested and kind. I have sent these editors a thank you note and asked if they could encourage others in the Sun Media Community Newspaper group (along the border) also to post the article. — and thanks to the intrepid trio for mentioning in the letter that we seek more witnesses. Lynne’s article about Baby Elle, now in Tax Connections. “..Lynne Swanson, who is part of a group fighting in Federal Court to have the controversial information-sharing deal declared unconstitutional, said she was disappointed by the CRA’s answer that it doesn’t know how many accounts at different levels were shared with the IRS. “They know what they reported so they can certainly tell us what they reported in terms of that $50,000 limit.”………. I didn’t see this one listed above. Am posting for archival purposes though it is from 2015. Interestingly it appears to be still open for comments if you wanted to try and show them that it is still relevant now in 2016. Lots of comments were made when it first appeared. Americans living in Canada are likely to qualify the presidential campaign between Democrat Hillary Clinton to Republican Donald Trump of “crazy”, the outcome might leave a divided nation. “It’s pretty scary that about half of Americans believe in [Donald Trump's ideas],” said Chris Helcermanas-Benge. The veteran of the US Army 73 years old now lives in Vancouver. He admits to have voted for Hillary Clinton, despite his Republican ideals. “I’ve been a Republican all my life. I’m basically the same as I always was. But since the Bush and Cheney of this world, I turned to the Democratic Party, “he told L’Atelier on the phone. “I think many people find this disconcerting campaign,” noted the Vancouverite Iclef Suzanne Herman. A dual US-Canadian citizenship, she said will not identify with any party. The reaction is the same side of Sydney Hegland, who left North Dakota to Montreal in 2014. “I think it’s crazy to see us as divided. It’s really weird to see how we can be stingy toward each other, “she lamented. According to the US Consulate in Montreal, about 40,000 Americans live in the metropolitan area. It was impossible to know the number of US nationals to the rest of Canada. “I would have voted for Republicans because of their platform. But I simply can not vote for Trump, “Ms. Iclef Herman said, noting that it will not vote in presidential elections. “I vote when I feel inclined to vote,” she hinted. Ms. Hegland do not vote despite his democratic ideals. She has described the campaign by Hillary Clinton as “corrupt”. She said the Democratic candidate is “sold to businesses and large corporations.” She added, however, that she would have voted for Bernie Sanders if he ran as an independent candidate. Several Americans living in Canada are reluctant to comment on the future of their country in the event that Donald Trump is elected president. They believe instead that it will be Hillary Clinton will win the elections. Helcermanas-Benge confessed to being “terrified” at the idea that Donald Trump becomes president, “mainly because the man is a fool, a racist and a criminal. At least he will not build a wall on this side of the border, “he quipped. According to Ms. Hegland, it is currently impossible to predict the outcome of this campaign. However, she also believes that the Democratic candidate win. “With Clinton, it will be roughly the same as under Obama. It will be the policy of “no change”. But Trump, who knows what will happen, “she has announced. There is no polling station for voters outside the United States. Americans residing in Canada who wanted to vote have done so by controlling their online ballot and by receiving at home. They then returned their choice by mail at the polls of the last US state where they lived. “….Stephen Kish, a member of the group fighting in Canada’s Federal Court to have the banking record sharing deal struck down, said one of the key concerns of those affected by FATCA is the confidentiality of their banking information. “The Canadians that I talk to, they are very concerned about the security of the data that travels between the CRA and the IRS,” Kish explained. “They are very worried because they know computers can be hacked, information can be stolen.”….”……. Thanks, Badger! Your comment gave me the great idea to compile a bibliography of John’s articles. This will be very useful! I’ve just started it and it can be reached through a link at the top of the main post. Great idea re the bibliography. Thanks for all your work @pacifica. Much appreciated always! Excellent. Thanks for doing this. If it helps I have some more articles by either Lynne or Lynne/Victoria. Lynne also did 4 articles for The Money Guide in 2013 but they aren’t available anymore (TITLES: Canadian Protection and IRS Tax Penalty Issues; Open Letter to Finance Jim Flaherty on FATCA; Open Letter to President Obama, US Treasury-Secretary Jack Lew, IRS Acting Commissioner Daniel Werfel and Senator Carl Levin; FATCA Protest — Standing up for Canadian Rights and Sovereignty). I wish I’d saved them by copy & paste. Title: Is Uncle Sam’s IRS After You? Thank you, EmBee. Very much appreciated! I’ll add them this evening.